About 20,000 current and former workers for British Steel are being offered advice on how to cope with changes to their pension scheme. The original retirement fund is being replaced by two new plans to help secure the future of the business. Pensioners must choose between a scheme run by the Pension Protection Fund (PPF) and an alternative backed by former steelworks owners Tata Steel UK. Advice sessions are being held at Scunthorpe Baths Hall until 21:00 BST. Representatives from British Steel Pension Scheme (BSPS) will form a panel with the PPF to answer questions. Earlier this year it was agreed the BSPS was to be separated from Tata Steel. Tata Steel will pay £550m into BSPS and give it a 33% equity stake in Tata Steel UK Ltd.
Members of the BSPS now have the option of switching to a new scheme (the New BSPS) or moving with the old BSPS into the Pension Protection Fund (PPF). Nic Dakin, Labour MP for Scunthorpe, said it was "very important" people made a choice. He said: "I think people feel a bit overwhelmed by it, some people feel angry about it, some people feel that December 11th - by which they have to make their decision as to which to go into - is not enough time." He said if people did not make a choice, they automatically would fall into the PPF. BSPS trustee chairman Allan Johnston said: "We want members to have the opportunity to ask the questions that matter to them." A PPF spokesman said: "Members of the British Steel Pension scheme will have seen a lot of speculation about the future of their pensions, so we want to reassure them the PPF is there to protect them throughout this process." 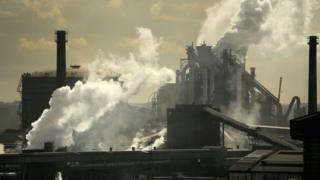 Britain's steel industry: What's going wrong?